Am I “Allergic to Life”? Claudia S. Miller, M.D., M.S., is an allergist/immunologist and tenured Professor at the University of Texas School of Medicine at San Antonio. Janis Bell (JanisB) reviews her personal journey of chronic illness after being inspired by a new article written by Jill Neimark and appearing online today in Discover magazine. It highlights the work of Dr Claudia Miller (pictured) and her theories relating to extreme chemical sensitivity and toxicants, a condition she terms, Toxicant-induced Loss of Tolerance or TILT. By the time I finished Jill Neimark’s “Extreme Chemical Sensitivity Makes Sufferers Allergic to Life,” (November 2013 issue of Discover Magazine - available free and online today), I was reconsidering my own story, the story I tell myself about the illness that changed my life. TILT happens when a susceptible individual gets sick after toxic exposures and then, instead of recovering, stays sick. Maybe that sounds like your story, but instead of chemical exposure it’s a tick bite, an unknown virus, a moldy house or workplace, or a traumatic event. I certainly felt it applied to my own descent into chronic illness, and as I read the article I thought carefully about my journey in a very new light - even though Miller's research and Jill's article, deal mainly with chemical sensitivity. TILT is believed to play a role in neuroendocrine diseases such as Gulf War Illness, and I couldn't help but wonder what kind of role it might play in ME/CFS. For years my story appeared straightforward - a sudden onset virus, that hit on the first Saturday of May 1987, led to chronic symptoms and no recovery. It changed me from an upwardly mobile professional to a downward-spiraling searcher of anything that would restore me to health. Over the next two decades, the name of my condition changed as did the clueless physicians I travelled to see, and the all-too-confident alternative practitioners whose fees ate into my meager income. While mainstream physicians waited for the virus to be identified by researchers and offered drugs for symptomatic relief - most of which I couldn’t tolerate - I immersed myself into research on nutritional, herbal, and energy therapies. Over the years, symptoms disappeared and new ones emerged. I experienced hope and disappointment. I was lucky to have three glorious periods of almost total recovery, until they ended within a few months in crushing relapses, each one pushing me lower on the Bell Disability Scale and giving me new challenges to deal with. I tried to understand what caused each relapse but my story didn’t change significantly until I read Martin Pall’s “Explaining Unexplained Illnesses” and learned how all of my extra diagnoses were connected by a vicious cycle of oxidative stress. Pall explains how nitric oxide and peroxynitrite, abbreviated NO and ONOO (like Oh! no!) damage cell membranes. The membrane is the “brain” of every cell as it decides what nutrient and messengers come in and what toxins and metabolites get out. He himself had CFS for many years. Through extensive reading as a biochemist at the University of Washington, Pall discovered that the NO/ONOO cycle, which is elevated in acute infections, becomes locked in that elevated state, interfering with cellular functions. I ordered the anti-oxidant supplements he recommends from Allergy Research Group/Nutricology, and I bought home test kits (Oxidata test kit from Apex Energetics) to monitor a urinary marker of oxidative stress known as MDA (Malondialdehyde), so that I could see if the antioxidants were doing anything for me. I’ve learned over the years that most of the things that happen to me don’t show up in medical tests, but my scientific curiosity won over me. Would MDA go up when I felt worse and down when I felt better? There did appear to be a correlation: I felt a little better when I moved MDA into the low range. Yet Dysautonomia/POTS, my most disabling symptom, together with PEM (Post-exertional Malaise), persisted with the tenacity of a pit bull. I was far from recovered, and far from the highpoints of remission I’d experienced in the past. Another influence on my own story came after reading Ritchie Shoemaker’s, “Surviving Mold”, while on a family trip to Costa Rica, lying in bed with a view of the Arenal volcano. After I laughed about having “first year medical student syndrome,” we uncovered a coating of the fuzzy black stuff on my bed frame and the underside of my mattress. We hurriedly checked out and moved into a breezy room at the beach. Within a few days, I could participate in conversations again. By the end of our stay I was walking to nearby restaurants. When I returned to the States, Dr Vinitsky (Enlightened Medicine) told me I had biotoxin illness as well as a few other opportunistic and causative pathogens no other physician had found, including Lyme disease. Thoughts about mold pushed the onset of my illness back to 1982, at a time when I took a teaching job at Kenyon College and was assigned an office in the modern Biology building. It was, I felt, the combination of windows that didn’t open, research animals in the basement, central air, and damp weather, that combined to spread mold spores throughout the building and into the air I breathed all day. I believed I had the classic respiratory onset, then endocrine and immune issues, all preparing the way for that 1987 virus to knock me down. When the ERMI (Environmental Relative Moldiness Index) test for mold in my current house came back with a high score (ERMI analyzes dust for fungal DNA and gives a score relative to other US households), we found mold in the basement under the crawlspace batts. Survivors online warned me that remediation rarely worked for people like me. Still my partner valiantly tried to save the life we knew, replacing and cleaning and sealing off the affected areas around the house. I would make a little progress but then crash again, reacting more and more violently to dust scattered in the air from his latest cleaning endeavor. In desperation, we contacted the remediator in “Surviving Mold”, the book that had become my bible, and took his recommendation to fog the space with Aerosolver. Even though it was custom made for my sensitive body, with ingredients I used in tinctures and eyewash (glycine and borax), it did me in and less than two months later, I was in the car heading out west, my loving partner left to deal with the wreck of our lives. Although many people online suggested I go camping, I never seriously considered it until the emergence of this crisis. 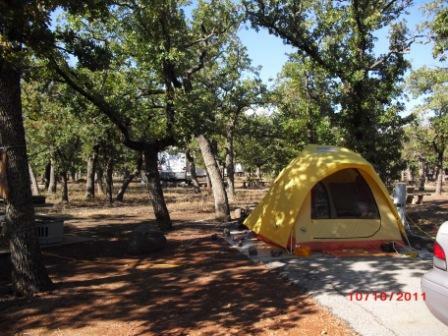 Nevertheless, camping is what I ended up doing when other accommodation I tried to rent affected my health even more. The camping lifestyle is difficult, yet I never regretted my choice. As symptom after symptom lessened or entirely disappeared, I put up with the hard ground, the cold, the heat, wind, the endless packing and moving, the whiffs of a neighbor’s cigar or cigarettes, the lousy WiFi, the inadequate cell phone service, the dirt, the noise, the diesel fumes of a one ton pickups and large motor-homes. And I complained whenever the cold wind ripped through my jacket or the rain left me huddled inside dripping nylon walls. Yet my ME/CFS diagnosis was sound, and approved by specialists. I’d met the Canadian Consensus Criteria and had been a subject for research studies. I felt there was an association between symptom onset and exposure. And it was interesting, if painful, to witness how certain exposures could suddenly bring on POTS and PEM again, but also satisfying when I experienced the relief as they went quickly away. It perplexed me that, while camping in the desert, I now seemed to be more reactive than I ever was back in Ohio. I had traded a disabling illness for one that left me as isolated and in my worst periods of relapse. I was spending too much time on survival and not enough on productive, joyful activity that could help me heal. I wanted a unit like the one Jill described in her article and that Dr Theron Randolph had created for his own patients. These specially constructed units with filtered air, cotton bedding, and purified water, allowed patients to improve enough that he could test them to find out what was making them sick. Willliam Rea of the Environmental Health Center in Dallas, houses his patients in similar rooms, but I was deterred by the expense, as well as the fact that my exploratory trip to Dallas had been a disaster (an experience I describe in this blogpost from October 2011 ). Camping was the closest I could get to an Environmental Control Unit. The toxic load theory of chronic illness was not unfamiliar to me. I had read the book from Dr Sherry Rogers, a former patient of Rea's, who had said, “Detox or Die”. But what did any of this have to do with ME/CFS? I and my friends were reaching the end of our patience. We had tried every classic detox protocol - juice fasting, liver cleanses, raw foods, sauna, and heavy metal chelation - with little or no noticeable benefits. Worse, my experience with juice fasting at Dr Gabriel Cousens’ Tree of Life Rejuvenation Center had brought on my second relapse. Yet there appeared to be some connection. After living in a tent for just over a month, I could tolerate CSM (Cholestyramine), the second step of Shoemaker’s mold illness protocol, although I had yet to benefit from its binding of fat soluble toxins. When I met with Dr Scott McMahon eighteen months later, my Visual Contrast Sensitivity had greatly improved from the reduction of systemic mycotoxins and other toxins that CSM, charcoal, and bentonite pulled out. Maybe Scott knew why I was hypersensitive? We are more sensitive to minute amounts of things that others tolerate with little or no problem. Sure, all these toxicants and toxins eventually catch up to some people, but they can stand at a bus stop in Manhattan or LA without getting congested, losing their balance or becoming suicidal. Dr Miller has proven that our sensitivity is real, validating the physical changes through publications in peer-reviewed journals. So why am I finding myself beset by gloomy thoughts as I get to the end of Jill’s article? No, no, NO! I’ve been clinging to the hope that someday I’ll live in the world again, go to stores, go to parties. This camping thing has got to end! I try not to dwell on the thought that I might always be living on the edge, vulnerable to the next exposure, a semi-hermit in our toxic world. But gloom settles into my bones. However, I remember that Lisa Petrison (Paradigm Change), an ME/CFS survivor who recovered her life through mold avoidance, once told me that nearly everyone is hypersensitive at first, but if they stick with a program of avoidance, they eventually improve. I mentally compared the intensity of my reactions in the past and my reactions now and noticed a slight improvement. I contacted Jill to clear things up. Yes, she says, Dr Miller argues that we’ll always be more vulnerable than a undamaged person, but we can recover with proper avoidance. Dr Miller herself was inspired by Randolph’s work because she saw people getting well in those non-toxic chambers as they unmasked and eventually were treated for their specific sensitivities. This encourages me in my plans to find land and build a non-toxic, healthy home where I can avoid mold and other toxicants. Since Dr Miller isn’t a clinician, the article did not go into therapeutic approaches beyond avoidance of toxicants and toxins. Yet Jill’s summary on the path of toxicants - through the olfactory nerve in the nose and directly into the limbic brain - got me thinking about therapies for the limbic brain that have allegedly benefited patients with MCS and ME/CFS such as Gupta’s Amygdala Retraining and Hopper’s Dynamic Neural Retraining. Individuals swear these approaches made a profound difference to their health. My own preference for “mind-control” is yoga. Since Jill's article mentioned one patient who recovered from electo-shock therapy, a treatment used widely in the past to change the brain chemistry of depression, I hold to the belief that we can mobilize and direct the electric patterns of our brains through our thoughts. For millennia, yogis in India have defied the tenets of modern science by walking on hot coals, warming a circle of snow with their body heat, and stopping their hearts - as have Christian mystics. Then I find myself wondering if toxins (made by nature as compared to man-made toxicants), shift a body into TILT in the same way as toxicants. Bodies damaged by toxicant exposure (Gulf War Veterans, Gulf oil spill workers) get opportunistic infections just like those of us with ME/CFS as well as those infected by chronic Lyme Disease. Are you at risk of Toxicant-induced Loss of Tolerance? If you think that as you can live in a house and can tolerate a few medications, you are not at risk of TILT, think again. Maybe you remember some doctors who judged you as malingering when you reacted to one medication after another. Maybe family members or former friends think you are crazy and overreacting because you seemed fine one day and complaining of misery the next. I recommend you give them a photocopy of Jill's article, “Extreme Chemical Sensitivity Makes Sufferers Allergic to Life,” so they can see that there is scientific validity for TILT. You might just be too masked to see what you are reacting to. According to Dr Lisa Nagy, a survivor of mold illness and TILT, and now an advocate for the environmentally injured, 60% of CFS patients have chemical sensitivity. If you react to supplements or to standard doses of medications, chances are you have more sensitivity than you realize. If I’d understood the value of Dr Claudia Miller’s QEESI questionnaire, I would have known before using Aerosolver that I was among the 12% deemed vulnerable enough to go into full TILT. My doctor could have advised me to avoid the risk because it was just too great, and I could be healing from mold now in a nice house or condo in the desert city of my choice. My friends and blog followers, if you have ME/CFS, be careful to avoid going into severe TILT. Click HERE for the QEESI questionnaire to see where you score. Print it out (it takes a while to answer and calculate everything). Then come back to share your score in the comments section below. You can follow Janis's journey on her blog: “Search for the Cure: My Healing Journey”. I took the QEESI test and scored low to moderate on the sensitivities part. However, my life has been pretty much halted by CIRS, and I scored 75 on the "effect on your life" portion, but it was due to mold avoidance, not chemical sensitivity. I can go into a mold-safe building even if it has a lot of chemical odors etc, but cannot go into an odor- and chemical-free building if it is contaminated by mycotoxins. I wouldn't stay inside a building that has odors but I have no particular reaction to it; it is an intellectual decision to not expose myself to this stuff. Yes, it was the winter of 2010-11 and I'd already been sick more than 20 years. Interesting. It's quite possible that the hypersensitivity that arises from mold is a different mechanism than the one that produces chemical sensitivity. Or that there are other factors which determine whether a person becomes TILTed to a severe level. It's a great message - for people to prevent more severe MCS before it starts by recognizing risk of TILT. As for whether the genes stay permanently messed up - we don't have that many people who have really managed to detox to the point of significantly decreased sensitivity, and those who do tend to take years or use very intense detox methods (IR sauna, coffee enemas, and more), so the assumption "it doesn't go back" could be true for people still being exposed but not necessarily true across the board. I feel like my gene expression is changing from mold detox. I find that my brain feels entirely different, too. Much calmer. So I think I'm getting amygdala calming too from the detox (without having to specifically focus on amygdala retraining). In my experience with mold avoidance and detox, I've come to think that the gene expression changes and sensitivity aren't a mistake but are probably smart moves on the part of the body. I almost never assume the body makes mistakes anymore. I don't see it as a malfunctioning body, I see it as a body trying to guide me to detox. Also, when I find things that detox me, my body grabs onto them in almost an addictive way. It knows what it wants. And I do get decreased sensitivity from detox, as well as a lot of other neurological improvements. I'd also comment that something else I'm shocked by is the sheer volume of toxins I had in me. I've experienced all different sorts of things coming out of me at different times with different side effects, but just a massive amount of stuff. It just keeps coming. I keep having to dig deeper with deeper detox methods, but I'm still getting improvements. I think the body was right to make me hypersensitive (to mold at least) to try to get me to detox like this. Maybe this would have been simpler before toxic mold was so rampant, and I could have just wandered away from a swamp and been "clear" easily in prehistoric times. But these days, countering the toxicity seems to involve good locations as well as tricks to speed up detox. Or at least that's what I'm doing. Great article - it fits me pretty closely. I am the model MCS patient, highly sensitive (intolerant) of chemical, food, and to some degree environmental (dust, mold, pollen). I can not tolerate most places. Among other things, pain is increased. I am quite certain circulation is restricted also, especially in chemical environments. Most doctors just do not even know this is a heelth condition to diagnose, much less treat. I do question the studies suggesting emotional/psych basis, though I do consider the brain (physiology) to be part of the problem (or could be). Firstly, I could not follow the whole thread/articles - probably went to too many places at the same time. But just to be sure? - Janis wrote this thread, Jill wrote the Discover Magazine article, and Dr. Claudia Miller, MD was referenced quite a bit as an early advocate of this illness and TILT. Secondly, I have a number of questions. Not sure if I can remember them all now, but I will try. 1. I would like to get proper diagosis of this illness, how does one go about doing that ? 2. Is there any bio marker tests that can be done to confirm? 3. Are there any clinics that actually do "exposure"/reaction testing to confirm this ? 4. Are there any direct blood/urine tests that detect micotoxins, biotoxins, ... ? 5. What is relation to true allergy (IgE) ? do allergy shots cure? help? how can desensitizing a few environmental allergens eliminate (possibly different) response to hundreds of foods and thousands of chemicals? 6. Can they narrow this reaction down to some immune response, or one of the 5 hyersensitivity reactions (http://en.wikipedia.org/wiki/Hypersensitivity) ? Or is it completely different ? or unknown ? 7. Is there any relationship to lose of control of the immune system, e.g. low alpha-MSH, low cortisol, or cortisol resistance ? or could something be damaged by high cortisol levels, e.g. PTSD initiated illness ? 8. Does Dr. Miller, or her clinic in TX diagnose or treat this condition, or is she just in mode to make others aware of this? Is she looking for study patients ? Dr. Miller doesn't treat or diagnose. Have you heard of Planet Thrive? You might join it and find some answers there. You guys are making this way too complicated. It's the same mechanism that causes ME/CFS, i.e. glutathione depletion. Glutathione is the body's main detoxifier. When you don't have enough glutathione to detoxify toxins, you get symptoms. When I take methylfolate and B12, thus building glutathione, my MCS gets better. When I don't take it, it gets worse. As to why would you get worse when camping - when you get away from the toxin, you start detoxifying it, but you haven't taken steps to rebuild glutathione. Therefore, you're depleting glutathione even more, therefore you react even more. Over time, once the toxin is detoxified enough, your glutathione is freed up to handle exposures again, therefore you don't react as badly. Just avoiding toxins may be enough for some people to recover, but they may always have problems because the glutathione depletion is a vicious cycle i.e., glutathione depletion causes more glutathione depletion. So unless you take steps to break out of the vicious cycle, it becomes a chronic condition. Some people can take glutathione directly, and some people can't. The best way to rebuild it and to break out of the vicious cycle, is to do methylation treatment. I have read "Explaining Unexplained Illnesses" by Dr. Pall, and followed many of the suggestions in the Therapy chapter. Did not help, not even a little, not even for a second. I have done glutathione precursors, liposomal glutathione, glutathione IV pushes, ALA, vitamin C, E, minerals, etc. Did not help, not even a little, not even for a second. I have done liver flushes, juicing diets, dandelion-milk thistle and other herbs, and detox fasts, etc. Again, nothing helps, not even a little, not even for a second. I've done methylation supplements, for years. I have spent 10s of thousands of $, nothing helps. I think Janis, and Jill, I think mention limited effects of detox. There must be something to it however, and it may help some, but not me. It's great that some are helped by methylation and glutathione, and its worthwhile to try, but for me, i just gotta dig a bit deeper, and i need a real diagnosis and a doctor who understands MCS and ME - first need to acknowledge/understand the problem before randomly prescribing drugs....and i just really think there is more to it than just needing a supplement or two. They also have to acknowledge the difficulty and seriousness of the problem and be able to admit that they may not be able to cure this impossible illness. I also think about how if we are 100x more sensitive to things than normal, than unless we are 99.999% effective with detox, than maybe there would still remain enough to set things off. I do feel at times like i am being poisoned, but it does not really feel like a hangover/detox to me. I do feel the immune system is all rev'ed up, and reacting to everything and all the effects are difficult to describe. It has destroyed my life. Abby, I did my 23andme. There are numerous genes involved in detox including liver pathways. I have a double deletion in c677t and in one of those important sod genes. Also some liver issues -- slow acetylator etc. some folks who can't handle dursban ( such as Scott) may have a weak pon1 gene. If you can study your 23andme you can get some clues. Has anyone here with MCS and/or CFS/ME tried hyperbaric chamber treatment for detox? In theory, it seems to make a lot of sense and it's exciting to think of a treatment that does not have as many side effects as medication, but I haven't heard of many concrete success stories. Dr. William Rea, who is pretty controversial, does recommend oxygen during a reaction; either a small tank or concentrator. 2-5 liters a minute I think. He also has a source for ceramic masks I think. Don't know all the details. "defied the tenets of modern science by walking on hot coals"
There is a well-understood mechanism by which once can walk briskly over hot coals which have been burning for a while. It's possible to get burned if one changes the setup; one firewalk went wrong when the organizers used burning timbers, rather that charcoal which had burned long enough to form a layer of ash. Result: twenty burn cases. Ouch. @BeatriceL, that's likely why you were able to live in a camplite with a short period of off gassing. A chemically sensitive individual couldn't. @plant, yes and no about trusting the body. It's a complex system and can make errors. I don't know the answer to this. There are physicians who treat MCS and others who treat Environmental Illness. Those who are members of AAEM http://aaemonline.org/ and ACAM are most likely to be able to help. 2. Is there any bio marker tests that can be done to confirm? Not as far as I know. 3. Are there any clinics that actually do "exposure"/reaction testing to confirm this ? Yes. This is done at Dr. Rea's EHCD http://www.ehcd.com/ as most extensive place in the country. Also done by Martha Grout in Scottsdale, by Kalpana Patel in Buffalo, and by others whose names I don't know, as some stay under the radar. Ask others in your geographic area. 4. Are there any direct blood/urine tests that detect micotoxins, biotoxins, … ?Yes, RealTime labs in Dallas tests for mycotoxins in urine and is recognized as the leader in this area of testing. 5. What is relation to true allergy (IgE) ? do allergy shots cure? help? how can desensitizing a few environmental allergens eliminate (possibly different) response to hundreds of foods and thousands of chemicals? There are different kinds of allergic reactions, and when the allergists all moved to IgE, many protested, including Dr. Theron Randolph who is mentioned in this article. You might read his book and get a better understanding of other pathways. Sterling Labs in VA does other kinds of allergy testing besides IgE using blood samples, but most physicians who follow Randolph test the patient. Miller follows Randolph in arguing that patients must be relatively clear of triggers for the testing to accurately determine their primary sensitivities. 7. Is there any relationship to lose of control of the immune system, e.g. low alpha-MSH, low cortisol, or cortisol resistance ? or could something be damaged by high cortisol levels, e.g. PTSD initiated illness ? All sounds possible. VIP supplementation, which works with MSH and cortisol and ADH, has been associated with reduced sensitivity. 8. Does Dr. Miller, or her clinic in TX diagnose or treat this condition, or is she just in mode to make others aware of this? Is she looking for study patients ? Contact her directly re study patients. She is not a clinician. Not everyone is helped by restoring glutathione and methylation. I've been doing this since 2005, but got nowhere living in an environment with my primary trigger, mold. I still take glutathione in various ways daily as well as methylation supplements. Be aware that there are other major detoxification pathways in the body, such as acetylation, which is the one used for pesticides and other toxic chemicals, and this requires nutrients such as niacinamide and B1.